Join the Imperial Legion! Legion has many garrisons in Vvardenfell. One of these, Fort Moon Butterflies, located south-west of Balmora. Legionnaires ratings follow the maintenance of law in the region, protect caravans, destroy dangerous predators, save the citizens of the Empire, and so forth. Those who are promoted to higher ranks, carry out the orders of the Emperor's personal and chivalry. Legion maintains close ties with the imperial cult, the Blades and the Fighters Guild, established friendly relations with the Mages Guild, Great Houses Hlaalu and Redoran. On the other factions Morrowind relationship either neutral or hostile. To join the Imperial Legion, you must go to the village and talk Gnisis there with General Darius. After he will enroll you into the ranks of legionnaires can start the task. Your first task - to collect documents on the ground at Vabdas widow whose husband recently died in a mine egg. The house is located in the west of the widow, outside the gates of the village. Go there and talk to the widow. However, in a conversation widow refuses to give you the documents, citing the fact that the Imperial Legion to blame for the death of her husband. It is not necessary to put pressure on the widow, it is best to talk to her. She will say that the last time she saw her husband in the egg Gnisis mine. There lies your way. Wander through the mine, you will encounter a ghost Mansilamata Vabdasa. He will tell you that he was killed by Legionnaire Lugrub Gros Ogdum, the ax is lying in the water nearby. Take it and go back to Darius. After you submit your proof of guilt Legionnaire General will direct you to accomplish over it fair penalty. Kill him and go to the widow with the news that her husband's killer got what he deserved. After that, the widow will give you documents. Bring them to Darius, and the quest will be counted. The next task will be - the healing of Queen kvaama in egg Gnisis mine. kvaama in egg Gnisis mine. Not a very difficult task. You should go into the mine Gnisis and cure the ailing Queen kvaama. For this purpose, you need to cure spell, acting on the remote target. Madura Sedan, a pilgrim from Aldus Velothi, disappeared a few days ago, and you must save her. Talk to scout Legion Ashsha-Ammu about the fate of the missing. And he says that to his knowledge pilgrim kidnapped Ashlanders rogue, whose camp is located north of Gnisis and south of Aldus Velothi. Find this camp and pay a ransom for pilgrim. After that, they let her go. Take her to the outpost in Ald Velothi and can go back to Darius. Assembler taxes Ragash gras-Shuzgub disappeared some time ago. She was last seen heading towards the tower Arvs drill in Gnisis to Baladas Demnevanni. Since then, it has not been seen. Go there and find out its fate. Before you talk to him about Ragashe, raise his relationship to you to 60 or higher. Then tell that Ragash already got her a lesson or that more Baladas will not be disturbed. In this case, he will let orkessu. Do not try to make him pay a tax, smug magician Telvanni still refuses to do so. When Ragash would be at liberty to return to General Darius. Darius general suspects that the soldiers began incomprehensible fermentation. And believes that this involved the cult of Talos. Talk first with Oritiusom Maro, and then, when expressed a desire to join a cult, with Arius Rulitsianom, in the sanctuary of worship. Once in the sanctuary, rummage all the chests and find a note Oritiusa Maro, which refers to the assassination of Uriel SeptimaVII when he arrives in Morrowind. On this note back to Darius. When you show him evidence of conspiracy, he'll give you a job - to execute the two conspirators. When Maro and Rulitsian are dead - the quest would be met. Next job is only for rank winner or higher. Emperor Uriel SeptimuVII needed drawings of the legendary Numidium by which Tiber Septim was able to conquer all of Tamriel. You should go to the area of ​​Red Mountain and return the ancient drawings. The exact location is unknown drawings, so you have thoroughly searched all the fortresses in the area of ​​Red Mountain. When the drawings are you - back to Darius. Ald'ruhn goes through a stream of smuggling Dwemer artifacts Imsin believes that the responsibility for this Drinar Varion. Go to his house and find some clues that may serve as evidence of his crimes. Come any Dwemer artifact. When you find what you were looking for, take the artifact and deliver it Imsin. Kill himself Drinara not recommended. Knight of the Order of Ebonheart Dzhonsis Dalomaks in trouble and you need to save it. Imsin believes that a knight holding a hostage in Daedric Ashurnibibi sanctuary, northwest of Hla Oad. Go there and dare to care Dalomaksu. When the knight would be safe, come back. Exile from home Telvanni Varona Nelas stole one of the Eternal Guardians of the glove, which was presented to him, his lover. And now blackmailing brave warrior, threatening to give out his secret. You need to go into the cave Assoumani, south-east of Ald Redaynii and find the glove. When you meet Varon Nelas, can either persuade her to give the glove in a good or kill her. When the glove is among you, take it or return Imsin legitimate owner, ilmenite Dren. In this and in another case, the quest will be met. Ilmenite lives Dren in Vivec, in the district of St. Delina, Channel One South. Eternal guards challenged Legionnaires. 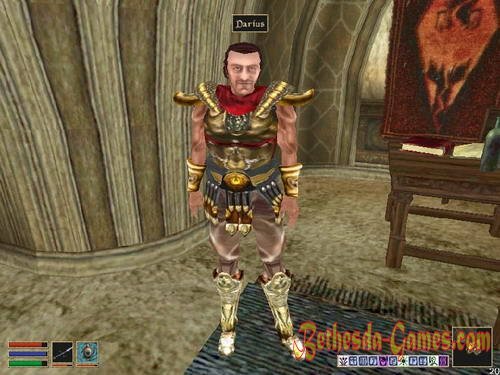 To meet him, you need to find and kill any Dwemer centurion and bring Rudd trimming metal taken from the body of the fallen robot. 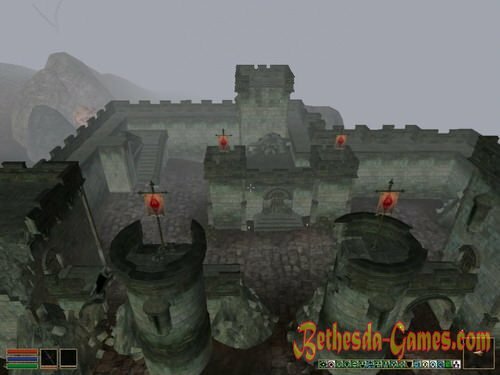 To perform the job you can use any of the Dwemer ruins, where you can meet the centurions, for example, the same Arktandt. Priest Imperial Cult Zhosen Anka heading into camp Ashlander Erabenimsun to introduce them to the imperial culture. However Ashlanders hostile attitude to the preacher. And soon he was gone at all. You should find out the fate of the unfortunate. So, arriving in camp Erabenimsun and talk to them, you will know that Zhosen is held captive by a witch named Zenammu. Go to her tent. Witch will tell you that the priest will release only in exchange for the hunter tribe named Assab-Bentus. To persuade the hunter to go to the witch, you can play on his pride, saying that he is afraid of witches. To prove their mettle Assab-Bentus follow along with you to Zenammu. When he comes back, the witch let the priest. Then you can return to the Fort. You need to save a citizen of the Empire Dandsu that the kidnappers kept in a cave Abernanit near Gnaar Moka. Go there, kill all the raiders and bring the woman out of the cave. When she will thank you for saving - back to Rudd. You need to go to Gnaar Mok, and kill a couple of NETZSCH that threaten the city. Their mating season, during which these creatures can be quite dangerous. You have to kill one male and one female. Unfortunately, it is impossible to distinguish visually. However, in the murder of each of them you will receive the message: "You killed NETZSCH sexually mature." Here's a hint, most often these creatures hold north of the village close to each other. When you kill the two, go back to the fort. Not far from Dagon Fel is a necromancer's lair, which call Sorkvildom Raven. You need to find him and kill to prove Dunmer that the Imperial Legion always punishes those who engage in the black art. Lair of the Necromancer is in Dwemer ruins, near Dagon Fel. Kill him and return. Salin Sareti Eternal Sentinel at the Tower rises in the Ghost Gate accused players in the absence of good manners, and now you have to prove to him that he was profoundly mistaken. Before you go to it, read the "Red Book of Riddles." Then go to Sareti and start the fight. To prove to him that the legionnaires can not only break the bricks head, you will need to guess its riddle, do not forget to bring a book. You can answer correctly only if you have a "Red Book of Riddles," or if your Intelligence is not less than 50. When Sareti recognizes that legionaries have good manners, return to Fraldu. You need to kill Hontyolfa, who once was a member of the Order of Ebonheart. However, he soon escaped and now works as a guard at Llaruzeyu Andreth in Aharnabi, shelter magicians and followers of the Daedra, near the Temple of Azura. You need to find and kill the traitor. One of the residents spreads slander about the Legion. You need to find and punish Surina Atonesa. You will find it in the registry on Viveka, in the temple district. Persuade him good not work, so you can safely kill him. In his office, he is one, so no one would hear his screams. Relations with ordinary interns this incident will not spoil. By the way, this is one of the legitimate ways to get indorilovye armor. When Surin Atones is dead, return to Fraldu. One of the legionnaires tarnished their honor killing. You need to find him before he will get to Residents. Find Sapriusa Entiusa to the Legion was able to take him to the Continent, where he will be judged by the Imperial Court. The culprit is hiding in warehouses Arena. Find him and bring in Ebonheart to Fraldu White. On the way, try not to be seen by an intern. Knight of the Dragon VariUs Vantiniusa you will find in the rest of the Supreme Council, Ebonheart near Duke Dren Vedas. However, until you reach the level of Knight-protector, it will not give you a job. You must return one of the relics of the Order - the legendary Kolchuga Lord. To get more information about her and how she was kidnapped, talk to Rufinus Alleyusom. 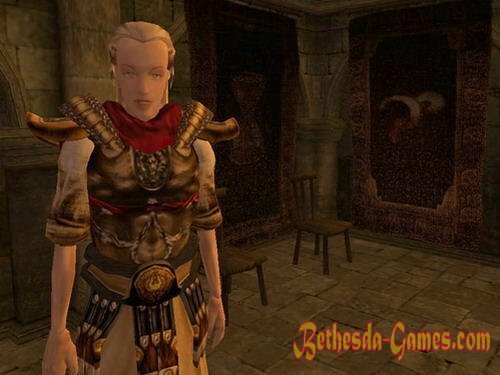 He will tell you that he suspects some Fyuriusa Atsiliusa and advise to ask about it in the garrison of the Imperial Guard at the Castle Ebonheart. Guardians of the castle will say nothing good, but report that Fyurius occupies the southwestern room. Go there and thoroughly search the it. Under the pillow you will find the key (key Shabby imperial style). Then go into the building of the Imperial Commission, and later in the sanctuary of the Order, in one of the walls is a secret door that opens with this key. Behind the door you open a passage in the underground caves Ebonheart. This is where lies the thief. Since voluntarily give cuirass he refuses, you have to kill him. After the battle, remove from the body of mail and return to VariUs. Chainmail have to give him credit. Legendary weapon was stolen many years ago Knight traitor and is now in the hands of the powerful sorceress Draramu chloral whose lair is close to Sadrith Mora in towns called Abanabi. You have to kill her and return Hrizamer VariUs. The next quest is only available for the rank Knight wreaths. To achieve the highest rank - Imperial Dragon Knight you will need to fight in the Arena Vivek with the current owner of this title VariUs Vantiniusom. Note that Mail will VariUs Lord, and in his hands he will keep Hrizamer. When VariUs is defeated, you will become the new Knight of the Imperial Dragon. By the way the Lord and Mail and Hrizamer move into your property.